« Clark Tenant Site Visit! Join expert in Delaware prehistoric pottery Dan Griffith for this two-hour, hands-on workshop. 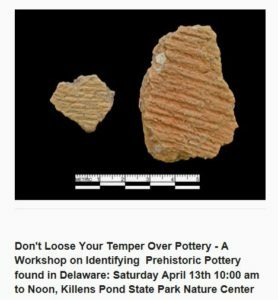 Learn the identifying characteristics of prehistoric pottery commonly found in Delaware. This is a Time Traveler/ASD training opportunity, and there is no state park admission fee when attending this event. FREE, but space is limited and it is important that you contact John McCarthy if planning on attending. john.mccarthy@delaware.gov – note that state of Delaware email addresses have changed! Update your contacts! Copyright © 2019 Delaware State Parks Time Travelers, All rights reserved.